> News > Will You be Missing a Trick this Halloween? With Halloween becoming more popular year on year and the UKs haunt industry growing at twice the rate of that in the US, can you afford to miss this opportunity to create a new revenue stream by adding a Halloween attraction to your venue or enhance an existing one? The first consideration to make is to decide on the age of your target audience, namely whether you are going to aim the event at very young children, older children or teenagers and adults. Your level of success will depend on customer satisfaction and traumatised five year olds or bored teenagers will not see your visitors coming back the following year! Once you have determined your audience, you will need to work out how much space you have available in which to place your maze and whether it will be indoors or out. Indoor mazes are preferable as they give more scope for theming and obviously inclement weather will not then affect visitor numbers. Construction of the maze will be the next issue, such as materials required (wood panels, fabrics, etc), whether it will be retro fitted to an existing building, be a straight forward walk through or a room maze where visitors make their way through a series of rooms. Also bear in mind the need for a queue line and where the exit will be to ensure a smooth flow of visitors through the attraction. The actual theme comes next. Will your maze be a spooky castle, a pumpkin palace, witches house or a trail maze where your visitors follow a series of clues? You also need to consider whether your maze will consist solely of props or if you will be including actors. If you are using actors, they will need training before the event and you will need to provide them with costumes, make up and a place for them to change. 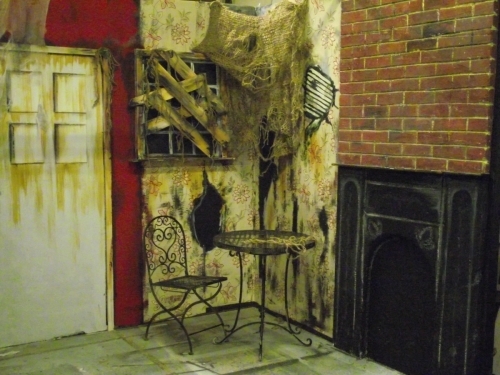 There are some very simple effects that can be used to improve the atmospherics within your maze such as air cannons, strobe lighting, sound effects and smells, along with visual illusions such as pictures which look different from varying angles and animatronics (spiders dropping from the ceiling, shaking skeletons or monsters moving back and forth for example). When you have decided where these effects and props will be placed, you then need to plan your power distribution, health and safety requirements and fire exits. We can help you with all of the above including design, consultation, fabrication and aftercare. We offer an “off the shelf” range of props and effects, click here to see wha we can offer, or we can build any bespoke items you need. If you have any questions or want to chat to someone about your ideas, give us a call 01243 837835.